Georgeanne Brennan moved to Provence in 1970, seeking a simpler life. She set off on her many adventures in Provençale cuisine by tracking down a herd of goats, a cool workshop, some rennet, and the lost art of making fresh goat cheese. From this first effort throughout her time in Provence, Brennan transformed from novice fromagère to renowned, James Beard Foundation Award–winning cookbook author and food writer. 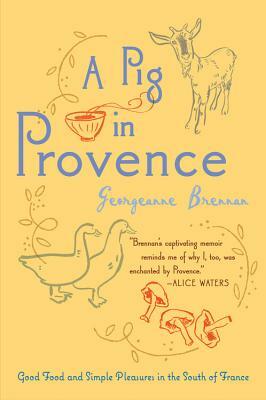 A Pig in Provence is the story of how Georgeanne Brennan fell in love with Provence. But it’s also the story of making a life beyond the well-trodden path and the story of how food can unite a community. In loving detail, Brennan tells of the herders who maintain a centuries-old grazing route, of the community feast that brings a town to one table, and of the daily rhythms and joys of living by the cycles of food and nature. Sprinkled with recipes that offer samples of Brennan’s Provençale cooking, A Pig in Provence is a food memoir that urges you to savor every morsel.